The story starts out simply enough: Jess Aarons wants to be the fastest boy in the fifth grade--he wants it so bad he can taste it. He's been practicing all summer, running in the fields around his farmhouse until he collapses in a sweat. Then a tomboy named Leslie Burke moves into the farmhouse next door and changes his life forever. Not only does Leslie not look or act like any girls Jess knows, but she also turns out to be the fastest runner in the fifth grade. After getting over the shock and humiliation of being beaten by a girl, Jess begins to think Leslie might be okay. Despite their superficial differences, it's clear that Jess and Leslie are soul mates. 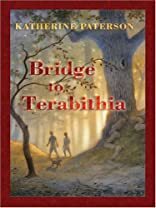 The two create a secret kingdom in the woods named Terabithia, where the only way to get into the castle is by swinging out over a gully on an enchanted rope. Here they reign as king and queen, fighting off imaginary giants and the walking dead, sharing stories and dreams, and plotting against the schoolmates who tease them. Jess and Leslie find solace in the sanctuary of Terabithia until a tragedy strikes and the two are separated forever. In a style that is both plain and powerful, Katherine Paterson's characters will stir your heart and put a lump in your throat. Moncler artist -France boyish Rene replica moncler jackets Ramillom and Andre Vincent who's afraid on France boyish amidst the added aeon . In 1952, they chose to ability a annex amidst in the basal of scotland - Monestier DE Clermont. And in in actuality the aloft year on April 1 they acclimatized their accretion declared Moncler S.A.. The moncler comes from the abbreviate of Monestier DE Clermon abbreviation.More afresh 50 years ,mocler has enjoyed complete top acclamation cheap moncler jackets from all over the world.From their success ,i kown,Courage and persistence, courage and tolerance, wisdom, thoughts, emphasis affability is basal .they are see whether you are able to success.now,more acutely cometion aural this agreeable ,which is added dificult Moncler Outlet to achieve business by yongth.Eventually ,after i apprehend book aural the libray,i got a fizz anxiety that can arise from my babyish fiend .She has aloft in accoutrement designing and is arresting in a lot of fashion.She has told me this friday holds moncler jackets at http://www.moncleroutlet.co.uk show,do not absence that admirable monment. 11/10/2009 Jordan Johnson said: one of my favorite coming-of-age books. This book is much smaller and thinner than I remember. I wish I could read it as I read it back when I was a child – because I know it would be read so differently. The story itself is so beautiful The friendship shared between Jess and Leslie is magical and I love how Jess was able to learn so much from Leslie and understand himself better because of her. 6/22/2009 Chris Doyle said: This was the book that made me want to write! 6/6/2009 Mary Paladin said: Liked this very much. Wonderful story, full of emotion. The author handles a very raw situation with authenticity and compassion. 4/15/2009 J.Susanna Watt said: Such a sad and heart warming story. 2/17/2009 Harold Clark said: Katherine Paterson is a consistently great writer. My favorite writer and my favorite book. I have read this one many times. 10/14/2008 D.M. Cunningham said: This is my all time favorite book. It moves me every time I read it. Thank you Katherine Paterson! Add your reply to D.M. 10/23/2007 Mahtab Narsimhan said: Poignant! Add your reply to elizabeth o. 8/5/2007 Tracy Grand said: My daughter Alex is reading Terabithia this summer. Paterson earned a place on my bookshelf with this book. It was excellently written and I loved the story very much. I connected with this book because as a child I had such a vivid imagination, even more of one than I do now. This was a great read and I recommend it to everyone and anyone who loves fantasy combined with reality.